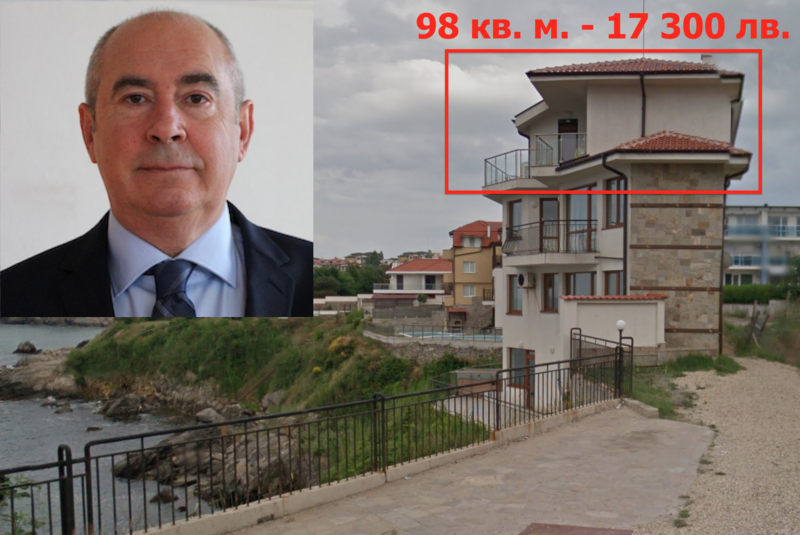 In 2002, Veselin Tsolevski paid only BGN 17,300 for an apartment of 68 square meters on the waterfront in the town of Sozopol on the southern Bulgarian Black Sea coast. The seller was the construction company BDK Ltd. The apartment, however, had one disadvantage – it did not have a direct view of the sea. But this injustice turned out reparable. In 2010, BDK Invest, with the same owners, offered to Mr Tzolevski, who was already 82, to exchange the apartment for another, larger one – 97.8 square meters in a cozy villa with a terrace and a wonderful view of the bay. The reason for this generosity towards the elderly man and his wife can hardly be explained by the principles of the free market, but there are other principles. The son-in-law of the now-late Mr Tsolevski is architect Ivan Nestorov, the current Director of the Directorate for National Construction Control (DNSK), who has previously held other senior State and municipal posts related to construction control. Precisely, in 2002, when his father-in-law, Tsolevski, bought profitably the first apartment, architect Nestorov was already a high-ranking official at the DNSK. And in 2010, when the swap happened, Ivan Nestorov was already the Head of the Architecture and Urban Planning Directorate of Sofia Municipality (City Hall), appointed there in 2006 by the then-Mayor (and current third-term Prime Minister) Boyko Borisov. Before this, for a short time, he was an acting Chief Architect of Sofia. According to the Property Register, the company “BDK Invest” had serious construction sites in Sofia at the time Nestorov was the Director of “Architecture and Urban Planning”. After his career in the Sofia Municipality, Nestorov was transferred to Ministry of Regional Development and Public Works, where he became Director of the Geological Protection and Urban Development Directorate. Considering that most of the BDK construction sites in Sozopol are on the waterfront and are often erected directly on the rocks, the investment in the father-in-law’s apartment looks well calculated and prescient. After being appointed as Head of the DNSK in 2017, replacing Milka Gecheva, Ivan Nestorov has submitted a completely “virgin” property declaration, as suits a conscientious civil servant who lives on wages and does now own a home or a bank account. Income from salaries – BGN 33,766 and not a penny more. In 2005, the mother-in-law of architect Nestorov, Zdravka Tsolevska, secured another gainful property acquisition. She bought an apartment of 92 square meters in the capital Sofia for only BGN 47,500. The seller was the construction company “Beta Iv Delta”. A reference in the Property Register shows that a similar apartment in the same building, but with a smaller area, was sold by the same company only a month earlier, for three times more – BGN 162,139. Bivol contacted the DNSK press office and asked a question to Mr. Nestorov whether he considered that the lucrative property acquisitions of his in-laws could put him in a situation of conflict of interest because at the time of the purchases he had exercised oversight on construction companies. We did not get a call by the time of the publication of this article, but we are ready to give him the right of reply and publish everything he has to say.